What is a good psychopath? And how can thinking like one help you to be the best that you can be? 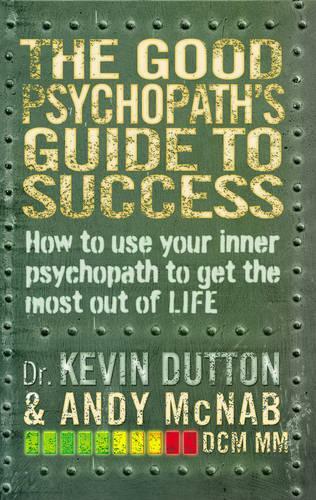 Professor Kevin Dutton has spent a lifetime studying psychopaths. He first met SAS hero Andy McNab during a research project. What he found surprised him. McNab is a diagnosed psychopath but he is a GOOD PSYCHOPATH. Unlike a BAD PSYCHOPATH, he is able to dial up or down qualities such as ruthlessness, fearlessness, conscience and empathy to get the very best out of himself - and others - in a wide range of situations. Drawing on the combination of Andy McNab's wild and various experiences and Professor Kevin Dutton's expertise in analysing them, together they have explored the ways in which a good psychopath thinks differently and what that could mean for you. What do you really want from life, and how can you develop and use qualities such as charm, coolness under pressure, self-confidence and courage to get it? The Good Psychopath Manifesto gives you a unique and entertaining road-map to self-fulfillment both in your personal life and your career.